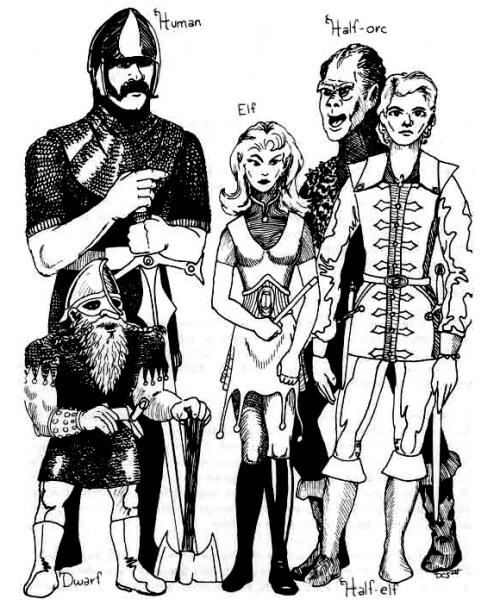 First published in 1978, the First Edition AD&D Players Handbook introduced the character classes that would become iconic in Dungeons and Dragons. Over the ensuing decades, expansions and new editions would increase the overall number of classes, and some would even reach the iconic status of these original 11, but with a few exceptions, the popularity and presence of those original classes has never faded. Advanced Dungeons and Dragons Player’s Handbook added the following “sub-classes” which are all full classes in their own right, but simply fall under the main heading of the four base classes, since they follow many of the same paths of advancement throughout the game. Thus, the two sets of classes above form the “core” and “secondary” classes of the AD&D game. Many more classes became available over the span of the first edition, the main sources being the Unearthed Arcana, which included the cavalier, thief acrobat, and especially the barbarian, an instant classic, despite the 6000 xp cost for second level. These classes can safely be considered a part of the “secondary” tier as well, except possibly for the thief acrobat, which if anything, can be said to have increased the need for a more expansive skill list, but been that claim is dubious. Oriental Adventures released a slew of character race and classes that we will tucked aside as a “setting specific” tome, and thus those classes are of “tertiary” importance at best. Of the initial 11 core classes, the illusuionist rolled into the eventual concept of a wizard’s “Schools of magic” of which illusion was but one of many, along with evocation, necromancy, and divination to name a few. As an “archetype” the idea of the illusionist survived mainly as a concept of specialized wizard. They were very unique in AD&D and even had their own extensive spell list, of which a few, like color spray, are classics. Another non-archetypal class is the assassin, which is actually in the Dungeon Master’s Guide with warnings against its use by players. The various tables in the PHB, however, include the assassin, so it is technically in the PHB, and besides I am an includer, not a denier, and will always vote for more classes, so the assassin is in, and with it, though it may not have developed into an archetype, pre se, is the idea of an “evil character” of which the old school games tended to produce more than later editions of the game. Therefore, the assassin is doubly worthy, since it gives a tacit acceptance to the anti-paladin, necromancer, bounty hunter, to name but a few traditional “evil archetypes.” the assassin might best be though of in terms of the archetype anti-hero, of which other classes, like warlock, vampire, or werewolf, might easily fit. There is no doubt that the monk and bard became instant classic archetypes. Dragon magazine was again helpful in providing updated versions of the classes, so that the bard could be played from first level, and the monk was given various treatment, to make him more or less like kung fu, usually. From Friar Tuck to a ninja, the monk was covered. Future editions would go one to promote or demote various classes over the decades since the first edition made it appearance. Second edition divided the cleric into the priest with dominions or areas of specialty, similar to the way arcane schools of magic were done. Pacificst priest became a viable class, and later on, with future editions, other types of priests like “laser cleric” who fired divine energy rays, or in other words was a ranged focused holy warrior; The invoker is another priestly type, being an avatar of a direct intervention of a deity. They bring down the flames of (insert deity) on the enemy. Similarly, another “divine” type of character class is one I think 4th edition brought to classic status, and that is the Avenger, a dark executioner of a deity, imbued with power, and trained in hunting down enemies to extinction. Not yet mentioned is the Sorcerer who was a unique take on the wizard, being an innate user of magic, rather than book learned, and usually involved dragon blood or some other influence. Being a complete re-imagining of the wizard, not so dependent on the traditional “vancian” style of magic, since they are not beholden to memorization of spells out of a book, but rather cast spontaneously, the Sorcerer is a perfect compliment to the wizard. The Third edition PHB might be said to have the most all inclusive set of classes, and it included the base 11 except for the lack of assassin and illusionist, which it replaced with the Barbarian and Sorcerer. I personally feel this was a fair trade off, if keeping the number at 11 is important, and would rate the 3e PHB as having the perfect set of core classes. However, other archetypes exist, and a truly great one would be inclusive of all. Fourth edition sadly only had 8 core classes in Players Handbook 1, and two of them were brand new. This was unfortunate, in that only 6 of the 11 established archetypes were present at launch. It would be rectified in the Players Handbook 2 and 3, the following years. On the other hand, the two new classes were the warlock and warlord, and they both became the two most beloved classes of that edition. The warlock was a creature who made a pact with a being of immense power, whence sprang their fell powers. The warlord was a captain, leader, and kept their allies going against all odds. With a new edition of Dungeons and Dragons being released, comes a game that claims to be “one edition to rule them all” and claims to bring ever edition,and play-style into one core game, with modularity for added complexity. Those are big claims, and if they are true, then this iteration of the next edition of the world’s greatest role playing game of all time might just become even greater yet. 14 classes, or possibly 12, if priest and cleric are rolled into one, and if wizard and sorcerer are also combined. If warlord can be made a sub-class of fighter, they could even get the number to that magical 11.